Newtown Radio is an Internet radio station housed in Brooklyn NY, designed to introduce listeners to cutting-edge Independent music. Newtown Radio Sessions offer an opportunity for artists to perform live and on-the-air from a high-quality recording studio in Brooklyn, to feature one or more of these songs from the peformance in a live video, and to stream these sessions for listeners around the world Sunday nights at 9 ET on Newtownradio.com. 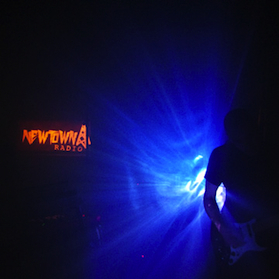 Curated by Newtown Radio's Founder/Producer Colin Ilgen, and together with Engineer/Producer Matt Stein owner of Swan7, the Newtown Radio Sessions officially began in October 2010. Check out our latest Newtown Radio Blog Entries! Newtown Radio joins the FMA with a mix of original session tracks by The Beets, My Teenage Stride, La Big Vic, The Immaculates, Punks on Mars, Light Asylum, Boy Friend, Chelsea Wolfe, Dead Gaze, Dive, Night Manager, So So Glos, Expensive Looks, Minks and Phonetag. "Newtown Radio is located at the Danbro Studios in Bushwick, NYC. We're here to bring you hot new bands from around the world, undiscovered local talent and hidden gems from the past"
Newtown Sessions are curated by founder/producer Colin Ilgen, and engineered by Matt Stein at his Swan7 recording studio. The sessions air Sunday nights at 9pm ET, and are also archived in video format here -- check out clips from FMA favorites Computer Magic and Dustin Wong after the jump.